If a hot tub is not insulated properly, you will easily notice, it takes a long time to heat up water meaning you need to pay more money to keep hot tub running. With over 13 years of manufacturing experience and years of lab testing, Our factory found a way to perfect an insulated hot tub. We have added R-10 insulation on the skirt and above tub tray which helps lock the heat radiated from electrical parts and transfer to plumbing. As results from our testing, hot tub with R-10 insulation and R-10 hard cover can save 41.3% energy comparing with a hot tub only has a thin insulated shell. Balboa utilises cutting edge technology and forward thinking to create easy to control spas with any feature you can dream of. 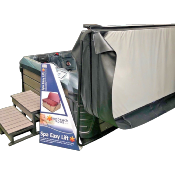 The GS100 implements piezo panels which eliminate moisture ensuring the panel's reliability and quality as well as MoodEFX Lighting to make your spa come to life! Start Things off with a FREE Handrail! This hand rail is made from black powder coated stainless steel tubing, it mounts to the spa skirt below the spa cover edge. 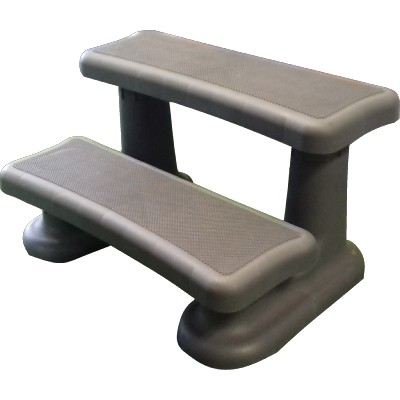 Held in place in an upright position with a long bar allowing for steady support from the bottom step upwards. Includes screws and caps. It is packaged in a box with a full-colour front making it great on display or alongside an example of the handrail. Keep your Hot Tub safe with a FREE Cover Lifter! It works on practically any spa while maintaining a sleek look and strong functionality. The Spa Easy Lift is made from aliminium with a black rust proof coating. 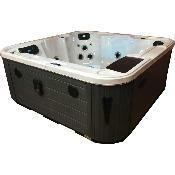 Suitable for most hot tubs and spas and fits any spa cover up to 96". Easy fitting with x2 Nylon catch straps. It is packaged in a brown box with a full colour from making it great for displays. We offer delivery to anywhere in mainland UK with prices depending on the distance. If you are unsure whether you are inside our range just go through checkout and if a delivery option isnt available you will need to call us. This warranty applies to the parts specified below for the period defined, as from the date of delivery to you and providing that you have completed your warrranty regisration within 30 days of that delivery date. Unlimited technical support. 24/7 Online support. 6 days a week support on phone in-store. Build up of limescale or other issues caused by the water supply used. 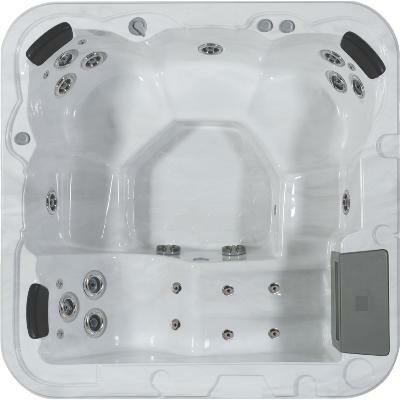 Additionally, we will not responsible for incidental or consequential damages or losses caused (including loss of use); plated parts when chemicals are used in the hot tub or when the hot tub is used with hard water; use of optional equipment not manufactured by the hot tub manufacturer regardless of the supplier; the units prior use as an operation of a display; or defects that should have been discovered prior to installation. A hot tub is not covered by this warranty if it or any of its components have been modified in any way, including the addition or removal of parts. A hot tub is not covered by this warranty if you have not completed the warranty registration form within 30 days of delivery. Whilst we aim to deliver stock items within 2-4 weeks (starting from receipt of payment), delivery times quoted are approximate and we cannot be held responsible for, nor offer compensation of any kind for, any factory errors or delays caused beyond our control (including, without limitation, Acts of God, delays pending customs clearance, governmental actions, war or national emergency, acts of terrorism, labour disputes or restraints or delays affecting carriers or inability or delay in obtaining supplies of adequate or suitable materials). Bubbles Showers & Bathrooms Ltd is an introducer appointed representative of Ideal Sales Solution ltd T/A Ideal4Finance. Finance available subject to status Loans of 25000 and above available on a secured basis. Think carefully before securing other debts against your home. Copyright © 2018 - Enter the copyright or legal information about your company here.